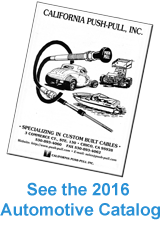 Quadrastat - California Push-Pull, Inc.
Arens also offers manufacturers a superior line of specialty controls for the remote activation of directional hydraulic spool valves which are engineered for use with push-pull cables and mechanical linkages. Arens ceo dual axis joystick controls allow the operator to control two functions with one lever. 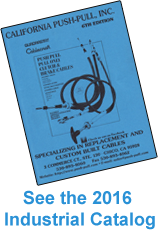 QUADCO® style grip can be added to provide an electrical interface for further feature control. Arens C80 Series single-function controls are designed with a heavy-duty lever for controlling hydraulic spool valves, winch valves or transmission valves. These controls provide a fail-safe, irreversible-4ocking action that automatically locks out feedback forces in either direction. 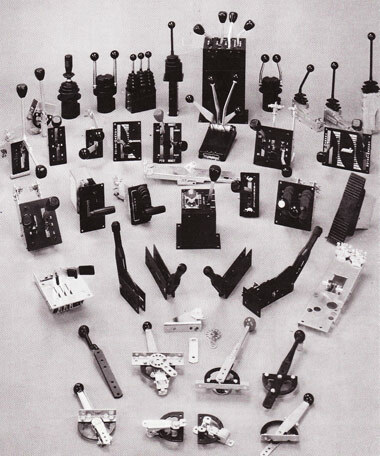 These controls are available with a variety of locking mechanism designs to meet a wide range of application requirements. The Arens Q36 control usesa “strap-shoe” lockingmechanismforpositive, reliable’ control in even the harshest of environments. The Arens Q15 features a dual “scissor” locking shoe for even greater application flexibility. Typical applications include engine throttle, hydrostatic pump, and variable sheave functions. • Scissor locking shoe mechanism holds lever securely in any position. The Arens Q14 locking lever control utilizes the same five element “scissor” locking shoe technology as the Q15 but without the friction peds. ~ is ideally suited to provide reliable control in a wide range of applications. The Arens C72 control lever offers several advantages, including more “repeatable” drag, finer adjustment with optional neutral detent, and more resistance to side loads.